An ultra-fine layer of EXP Coating is bonded to the 80/20 bronze wrap wire which is then wound onto the hex-shaped core wire. The result is a built-in barrier against the corrosion and wear that can quickly sap the life out of your strings and your sound. Genuine phosphor bronze alloy retains flexibility as well as brilliant tone for many hours of hard play. Computer-controlled wrapping around a hex core ensures consistency and extends life. 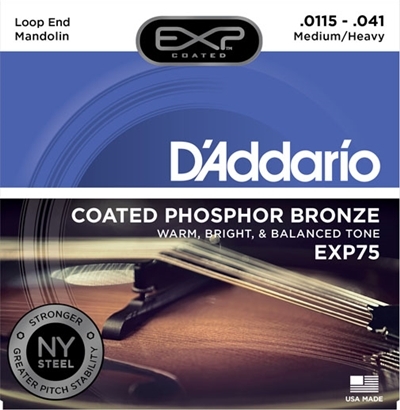 I am loving the D'addario EXP-75 strings I bought from Strings By Mail! The tone really comes through my mandolin with the heavier gauges the EXP-75 offers. Strings By Mail really came through with a cheaper price and quick delivery. I will definitely be re-ordering soon!! Thanks!